A review of relevant recent research indicates that girls’ issues are generally off the radar screen in local pre-K-12 schools in the United States. This is particularly problematic because gender inequities continue to be perpetuated in schools through largely unconscious cultural mores and pedagogies. 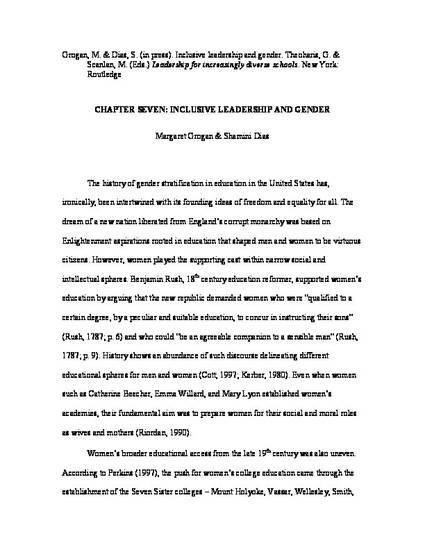 Gender inequities are deeply rooted in historical, philosophical, and cultural narratives of gender so that we, educators, are ourselves articulations of gender-based narratives. Moreover, the intersectionalities between gender, race, English speaking ability, sexuality, class, religion, ability, poverty etc. greatly exacerbate this problem. Together with their teachers, principals must develop critical self-awareness as well as intentional ways of thinking, responding, and acting if schools are to help offer many gender narratives from which our students can choose. Gender stereotypes limit the growth and development of both girls and boys. School leaders need to draw attention to the pervasive gendering of classrooms and school buildings through discussion, data, and deliberate interventions. In particular, school and district data must be disaggregated along all of the various markers of marginalization: by gender and race, gender and socio-economic status, gender and ELL status, gender and special education placement, gender and religion, gender and sexual orientation and so on.